Image caption Russia said the S-300 system would "significantly increase the Syrian army's capabilities"
Russia says it has delivered new anti-aircraft missiles to Syria, two weeks after a Russian reconnaissance aircraft was shot down in the country. Russian Defence Minister Sergei Shoigu said four S-300s launchers had arrived in Syria on Monday. Fifteen Russian servicemen died when their Il-20 plane was accidentally downed by Syrian forces during an Israeli air strike in Latakia province. Russia blamed Israel for the incident - a charge denied by Israel. Israel, which insists Syria's military was to blame, has warned that giving the S-300 to "irresponsible actors" would make the highly volatile region even more dangerous. US national security adviser John Bolton had said Russia's decision to deliver the S-300s would cause a "significant escalation" in Syria's civil war and had urged Moscow to reconsider. Russian plane downed in Syria: What may happen next? Russia has an airbase in Syria from which it carries out air strikes in support of Syrian President Bashar al-Assad's forces. What did the Russian defence minister say? At a meeting with Russian President Vladimir Putin, Mr Shoigu said: "We have completed the delivery of the S-300s systems." He said that 49 pieces of equipment had arrived in Syria, including four launchers, locators and control vehicles. Syria's unified air defence control system would be fully operational by 20 October, the minister added. The delivery of the S-300 system had been suspended in 2013 following a request from Israel. But after the loss of the Russian plane, Mr Shoigu said: "The situation has changed. And it's not our fault." How was the Russian plane shot down? The Il-20 was hit about 35km (22 miles) from the Syrian coast as it was returning to Russia's Hmeimim airbase near the north-western city of Latakia. Russia's news agencies said at the time that the plane had "disappeared during an attack by four Israeli F-16 jets on Syrian facilities". Russia's defence ministry later said that Israeli jets had used the Il-20 as cover. It said Israel had failed to give it adequate notice of the attack, putting the Russian aircraft in the path of Syrian air defence systems. Mr Putin told Israeli Prime Minister Benjamin Netanyahu by telephone that the decision to strengthen Syria's air defences was "primarily intended to thwart any potential threat to the lives of the Russian military service members", the Kremlin said. Mr Netanyahu warned Mr Putin that "providing advanced weapons systems to irresponsible actors will magnify dangers in the region", according to the prime minister's office. He also said Israel was "determined to stop Iranian military entrenchment in Syria and the attempts by Iran, which calls for the destruction of Israel, to transfer to Hezbollah lethal weaponry [to be used] against Israel". Hezbollah, a Lebanese Shia Muslim militant group, and Iran are both allies of the Syrian government. Mr Netanyahu also expressed his confidence in the credibility of the Israeli military's account of the circumstances surrounding the downing of the Russian reconnaissance plane. Israel's military insisted that its jets were back in Israeli airspace by the time the Il-20 was hit and said responsibility for the incident lay with the Syrian military. 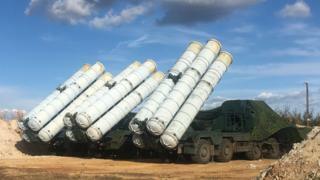 Could the S-300 prove a game-changer? Israel says it has carried out more than 200 attacks against Iranian targets in Syria over the past 18 months. In that time, only one Israeli jet is known to have been shot down - an F-16 which crashed in northern Israel. Israel has long sought to persuade Russia not to supply Syria with the S-300. While it is not Russia's most advanced surface-to-air missile system, it has been likened by experts to the US Patriot Air and Missile Defense System. Russian plane deaths in Syria: What will be the consequences?